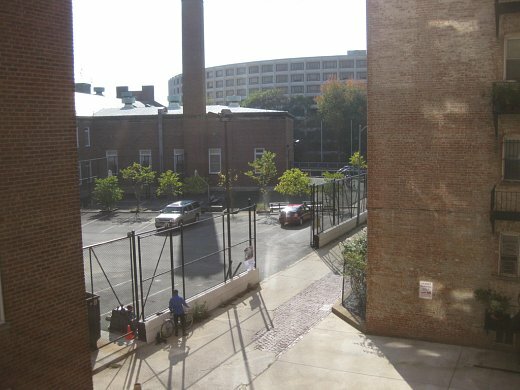 I hung my poster in the public alley behind my apartment building because it looked similar to the lot in the photo, and because it’s a cool, quiet, regularly trafficked public area. Just as I was hanging it, an identical SUV to the one in the photo pulled into the parking lot! I saw one biker pass by before I left home, and hoped that it would stay up until the kids got to school the next morning (that’s a school parking lot), but when I came back last night it was gone. The caption card was left behind on the ground, which leads me to believe it was a deliberate theft and not an angry property owner. 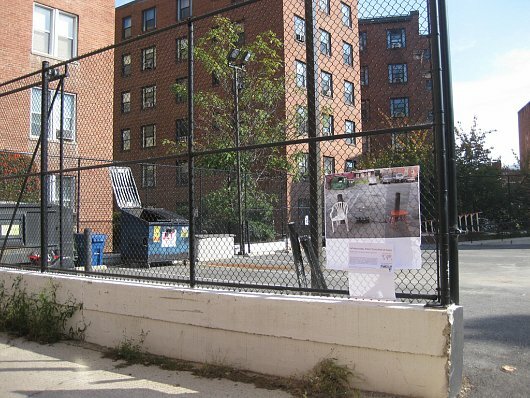 Street Chairs Save Broken Street Swing was located in the alley/parking lot behind Oyster Adams Elementary, 2020 19th Street NW, Washington D.C. The alley is accessible by Columbia Road. Installation and photos by Laura Manville.